I was supposed to go try out the new pool I recently became a member of today. The weather disagreed with me. On my way home from work, the rain was coming down hard, although I did not hear any thunder. However, once I got home, the sun was out and the rain stopped. I was on the fence at this point. The pool was less than a 10 minute walk away, and therefore, I could not in good conscious drive over. With my luck, I would walk over, swim a couple of laps before getting kicked out due to another storm passing through. Then what? Then I’d be stuck there waiting it out because I was too afraid to walk home in it. As of right now, it doesn’t seem like the case, but it’s too late, I made dinner and I ate it. I will try again Thursday. At least this leaves me some time to tell you about the awesome day I had in Manhattan on Saturday. It was pretty exciting, and filled with yummy treats (it is me, after all). I Metro-North’d it into Grand Central Station and the first thing I did was pick up a small iced coffee from Joe the Art of Coffee. That hit the spot on this rather warm morning as I walked from Grand Central to Penn Station where I was meeting my fellow traveler for the day, Liz. It was a long sweaty walk. 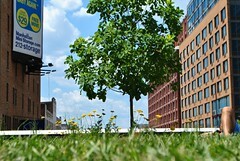 Once we met up, we wandered over to the Highline. They had recently opened up a new section of the Highline that extended up to this area. We found it and soon found The Lot located at the very end. 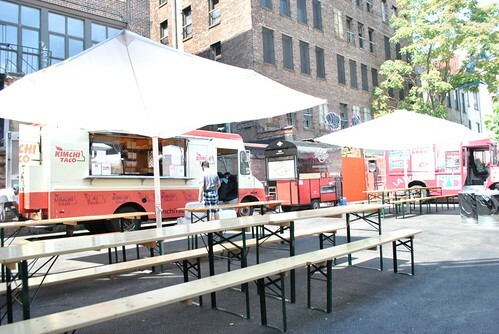 The Lot is literally a lot, with a bar on one end, and various food trucks along the other. There was some picnic tables set up for one to enjoy this bounty. 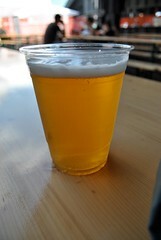 The Lot on Tap is operated by Colicchio and Son’s and offers a variety of wines and seasonal beers from the Brooklyn Brewery. 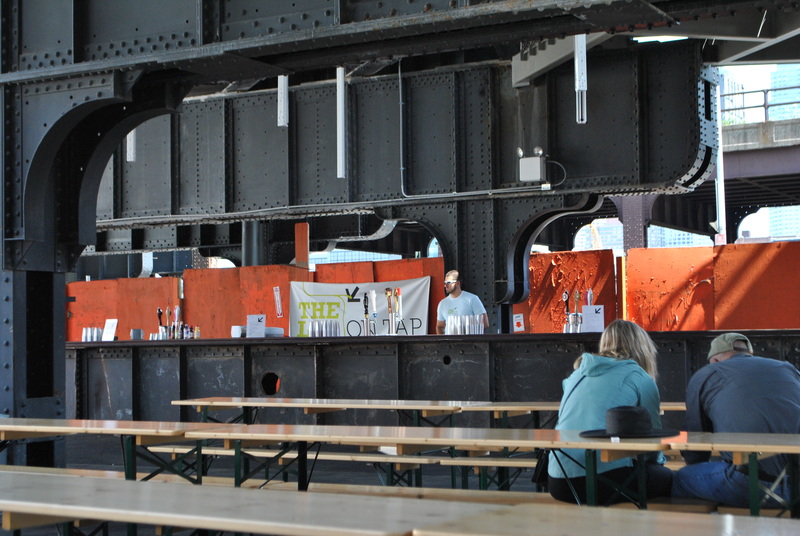 It was only a little after 11am at this point, and the food trucks were still setting up. As we had walked past the bar, I noticed they had Captain Lawrence Liquid Gold on tap. It was a hot day, I needed something cold and Liquid Gold isn’t so easy to find. I got me some of that! It was as delicious as I remembered, when I first sampled it at the Captain Lawrence anniversary bash a couple of months ago. Crisp, smooth and with just enough of that hoppiness before it got too hoppy for me. At around noon, the Food Trucks were up and running. 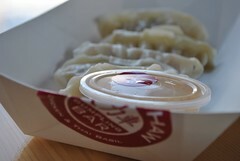 We decided to start off with some Chicken Thai Dumplings from the Rickshaw Dumpling Truck. I swear, I think they used to come by Cooper during my last year there. This was when food trucks were just starting out, and I somehow missed that boat! The dumplings were very good. I prefer my momma’s dumplings which are pan fried with crispy bottoms. These were not pan fried, but the insides made up for it. It was not dry, and very well spiced. The peanut dipping sauce was also a nice accompaniment. For our main course, we tried the four taco sampler. I cannot remember exactly each one. I remember, one is Korean BBQ, another had falafel and yogurt sauce, another was a chicken and the last may have been pulled pork. All topped generously with kimchi and asian pico de gallo. 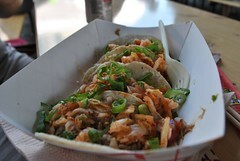 I was never a fan of kimchi, but put it in a taco, and I’ll try it. They were all very good (and messy!). Spicy they most certainly were, but I was able to get through a majority of it. To end, we each (ice cream cannot be shared) got an ice cream sandwich from the Cool Haus truck. So many different combinations of cookie and ice cream, what does one do? Liz went with a double chocolate chip cookie and a mint ice cream (with real crushed mint leaves in it and it wasn’t frighteningly green! ), and I went with red velvet cookie with balsamic figs and marscapone ice cream. I eat slow, and this may have been a poor choice. Totally worth the mess that ensued! The cookies were soft and very cookie like, and the ice cream was portioned generously and oh so delicious. We walked off this meal along the Highline and took a quick break at Chelsea Market before heading further downtown to the West Village for some gelato from Grom. Grom was delicious. I got a small cup with a scoop of the nocciola and stracciatella. 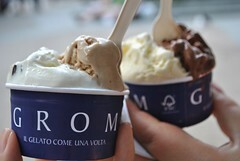 It was wonderfully dense and creamy as gelato should be. The nocciola was not overwhelmingly sweet but had a nice strong hazlenut flavor to it. The stracciatella was light and filled with chocolate bits. More walking was needed to burn this off! 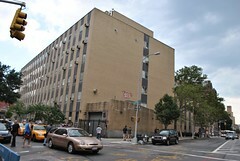 We took a walk to bid our farewells to the old engineering building of The Cooper Union. They were tearing it down soon, and after four years of blood, sweat and tears poured into the classrooms of that building, there will always be a little spot in our hearts for it. I then met Alli and Greg for dinner at the Lotus of Siam for some upscale Thai food. Upscale and Thai food don’t normally go together, but let’s see what they can do! I had a tofu pad thai (I’ve been craving pad thai), which was presented partially deconstructed. It was really good. The flavoring was great and the portion was filling without feeling overwhelming. I think for the more inventive dishes, this is a great place. But, for the more basic Thai dishes, street food will always be better on the street. Then we made a dash for Battery Park. 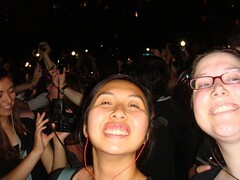 We were about to participate in the latest MP3 experiment from Improv Everywhere that night. A sort of Flash Mob, if you will. We made it there just as it started. I hit play on my trusty little ipod, and an hour of silliness ensued. 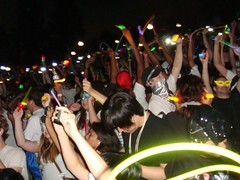 We waved, danced with and took pictures of strangers, and just made a scene all around. There must have been at least a thousand people, but we were there to make contact, and we did. The night was ended at a cute little ice cream/cafe before I hopped on the next train out of Grand Central home. I felt like a little kid on her way home from a big adventure in the big city, excited, but ready for sleepy time. For all pictures taken on this adventure, click HERE! 2 Responses to Saturday in the City! Three ice cream stops in one day and the pregnant woman wasn’t a part of it! That’s just wrong. Sounds like you had a great city adventure!